In 1997, the Argentine province of Chubut published a tourist brochure that, because of a cartographic error, showed the town of Los Antiguos, in neighboring Santa Cruz province, as part of Chile (Los Antiguos is only a few kilometers from the border). Responding to protests from the Santa Cruz legislature, Chubut recalled tens of thousands of maps at a cost of roughly US$100,000. Something similar happened last week when the northern province of Salta distributed a fifth-grade atlas that shows the British-governed Falkland Islands, which Argentina claims as the Malvinas, under their English language nomenclature. According to the Buenos Aires daily Clarín, the publisher in question - whose editorial director is a former university rector in Salta - defended the book, saying the entire map of the South American continent (see the pertinent section in the illustration above) appears in English. They could, he suggested, add an addendum to show students that this is "how the Anglo-Saxon world sees us." Apparently, however, the book was never approved by the former Instituto Geográfico Nacional, the government agency that zealously defends Argentina's borders from dangers such as guidebooks that might make similar "mistakes" - no matter the language in which they appear. Not unique to Argentina, this is a legacy of the era when the military were responsible for mapping the borders of the newly independent South American countries, and many disputes have lingered into the recent past. In 1978, for instance, Argentina and Chile nearly went to war over three small islands in the Beagle Channel of the Tierra del Fuego archipelago. Placing explanatory stickers on the offending map would be the simplest solution. If that's not acceptable, the cash-starved province may have to dump US$2.3 million worth of atlases into the recycling bin. In the mid-1980s, when I spent a year in the Falkland Islands, there were almost no tourists and very few roads of any sort. Even on the two big islands, East and West Falkland, the main means of transportation was the ten-seater Norman-Britten Islander, pictured here landing on a dirt airstrip at Saunders Island. Today, though both main islands have pretty good roads, the Islander remains essential for reaching outlying islands that contain some of the South Atlantic's best wildlife sites. Over the past several years, the Islands have become popular for their concentrations of penguins, albatrosses, cormorants, elephant seals, sea lions, fur seals, and other fauna. Most visitors arrive by cruise ships - when I was in Stanley last December 7, several ships with more than 4,000 passengers (more than double Stanley's population) were anchored in the outer harbor of Port William (they're too big to enter Stanley's sheltered inner harbor). Many of the visitors, though not all, came ashore to be shuttled to wildlife sites such as Bluff Cove, whose large gentoo penguin colony is easy to reach on a day trip before returning to the ship. Not to disparage Bluff Cove, but the handful of visitors who fly in for a week or two from the Patagonian city of Punta Arenas, Chile, see the islands more throughly and intimately. They have the option of overnighting at wildlife lodges at fauna-rich sites such as Sea Lion Island and Carcass Island, among others, that are accessible primarily by Islander aircraft (smaller cruise ships do visit Carcass, but only briefly). Until recently, though, tourist traffic has not been a high priority for the Falkland Islands Government Air Service (FIGAS), which exists primarily for the benefit of local residents. This may soon change. Sean Minto, the new FIGAS general manager, wants to double the number of tourist flights to increase revenues (tourists are not eligible for the subsidized fares that local taxpayers have). If that's the case, more visitors may be enjoying the South Atlantic wildlife, as well as aerial views of the Islands' spectacular shoreline from the Islander. For the time being, though, their numbers will continue to be limited by Argentina's refusal to allow more than a single weekly commercial flight from Punta Arenas, even though LAN Airlines (which needs permission to cross Argentine airspace) would like to increase frequencies. The only other option is an expensive Royal Air Force charter from Brize Norton, in Oxfordshire, via Ascension Island. No, this is not another anti-tobacco screed - rather, smoke has risen to the top of Argentine politics in an unexpected way. For the past week or so, fires in the Paraná delta, set to encourage new pasture growth, have gotten out of control. Ever since the Pleistocene, of course, humans have used fire to clear brush and rank grasses to encourage game and livestock or prepare land for cultivation. These current fires, though, may have contributed to fatal accidents on the freeway between Buenos Aires and the Paraná river port city of Rosario. They have certainly delayed flights out of Aeroparque, Buenos Aires's domestic airport, and bus departures into and through some of the affected areas. In the stagnant autumn air, the city itself is suffering from settling smoke that has carried elsewhere in Buenos Aires province and also into Entre Ríos and Santa Fe provinces, and even Uruguay. For weeks now, Argentine farmers and the federal government have been arguing over rising export duties on soybeans; over the past several years, as the government has limited (and occasionally prohibited) beef exports to keep domestic prices low, many farmers have increased their soy acreage at the expense of livestock. This has led to beef shortages and, combined with the new soy duties, farmer-led roadblocks that left urban supermarket shelves nearly empty - some stylish restaurants even had to restrict their menus - and brought rising prices. The fires may represent an effort to improve marginal pasturelands for grazing - however untimely and inadvisable that may be. The government, meanwhile, has strongly implied that farmers have set fires as a form of political and economic sabotage and has issued search warrants for some properties - even though, as the Buenos Aires Herald points out, much of the public may blame the government for tardiness in responding to the fires. A lack of rain in this normally humid climate has certainly intensified the crisis but, as so often happens in Argentine politics, the default option is a conspiracy theory. In the interim, air travel in and out of Buenos Aires remains subject to delays. On the ground, because of diminished visibility, police are enforcing slow traffic zones - an overdue measure in a country where reckless driving often seems to be a national sport and enforcement is normally risible. While I've been busy with income taxes and contemplating new entries on the fire-induced smog of Buenos Aires and the Lonely Planet guidebook controversy, it's come to my notice that my own publisher (Moon Handbooks) is giving away several copies of the new edition of my Argentina title in a third-party contest. While I'd like to think that's reason enough to enter the contest, I'm only second prize - the first is a week's accommodation in new boutique hotels in and around Buenos Aires. Full disclosure: I have no connection with the loose alliance of hotels in question, and have visited only San Antonio de Areco's Patio de Moreno (anonymously, and I did not stay there). The contest implies no commercial endorsement on my part, though I thought the San Antonio hotel was nicely done. For non-native English speakers, an explanation of the headline above: The late actor and comedian W.C. Fields is widely known for disparaging his Philadelphia, Pennsylvania, birthplace. One joke commonly attributed to him is a contest in which first prize is a week in Philadelphia; the second prize, two weeks in Philadelphia. There appears to be no documentation that he ever really said this, however. Meanwhile, I'll get to the other topics in the next few days. In her novel Daughter of Fortune, Isabel Allende vividly relates the historical connections between Chile and California - especially between Valparaíso and San Francisco - and the role that Chileans and other immigrants played in the California Gold Rush. One theme she overlooks, though, is the similarities between the natural environment of the two countries - make no mistake, California is a country in almost every sense of the word - and the way in which contacts between them have affected the landscape. That came to mind yesterday when the San Francisco Chronicle's Wednesday Garden section published an article on the copihue, a climbing vine whose reddish blossom is Chile's national flower. Known here as the Chilean bellflower, it first came to Berkeley's University of California Botanical Garden through Elbert Reed, who worked at the El Vergel nursery near the Chilean city of Angol in the early 20th century. Oddly, the Chronicle article claims that the nursery, which I last visited a couple years ago, is now defunct, but its website runs into late 2007. It's worth adding that the the movement of flora between Chile and California is not a one-way process. In the austral spring, from September on, the California poppy - the state's own official flower - carpets Chile's Mediterranean hillsides just as it does in the northern hemisphere after California's winter rains cease in March or so. Part of what I do, as a guidebook writer, is to visit and review hotels which, in reality, can be one of the most tedious tasks imaginable. There's a mistaken impression, though, that hotels shower guidebook writers with presidential suites and extravagant freebies in order to get the best possible coverage; in reality, freebies of any sort are a rarity--especially given that there's rarely space for more than a paragraph or two in a comprehensive guidebook to a country or even a city. Ethics aside, the effort it takes to get freebies, even if you're so inclined, is rarely worth it. 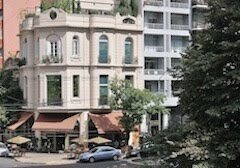 Thus, when I spent most of the last week in Santiago de Chile, I stayed at an inexpensive hostel (though I splurged on a private room) and spent parts of several days inspecting luxury hotels such as the copper-faced Santiago Marriott. As I sat in the Marriott's lobby, awaiting a public relations person who would show me around, I couldn't help but notice a short, scrawny man, dressed in black from head to toe, with straight black shoulder length hair and tattoos from his wrists to the armpits of his sleeveless shirt. He was, it seemed, an atypical Marriott client, but after PR arrived I quickly forgot him. Reading the Santiago daily La Tercera the next morning I figured out what I'd seen and what I'd missed. According to the paper, Ozzy Osbourne was staying at the Marriott and that same night he packed 20,000 metalheads (this being Chile, I'm tempted to say "copperheads") into the Estadio Nacional's Pista Atlética. Ozzy, though, is bulky rather than scrawny, and I had seen his bass player Rob "Blasko" Nicholson. Not so many years ago, Chile was a backwater for international acts of all sorts, but nowadays its prosperity has made it an almost essential stopover for foreign artists on world tours (Bob Dylan played the city recently and Rod Stewart is due shortly). Despite Chile's durable cultural conservatism, the country's youthful metal fans and other subcultures are conspicuous on Santiago's streets and elsewhere (one enthusiastic attendee interviewed by the daily El Mercurio had taken an all-night bus from the southern city of Concepción). In a country whose traditional wealth (and presently strong peso) derives from the mining sector, there's a sort of symmetry at work here. Copper, after all, is a heavy metal.